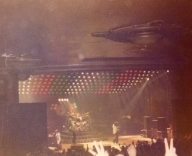 Freddie's black leather pants had both blue and red kneepads just to keep the football fans of both Liverpool and Everton happy, as Brian explained at some point during the show. For their own amusement during the acoustic set, Brian and Freddie played a bit of Mull Of Kintyre after Freddie mentioned how Wings had just played in Liverpool. Freddie jokingly said, "I'll be Linda McCartney." The band perform Liar on the second night in Liverpool, as they always did when playing two consecutive nights at a venue on this tour. The first picture was taken by Jim Jenkins, and the second by Ian Stewart Brown during We Are The Champions.